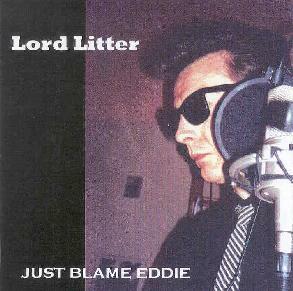 Lord Litter - "Just Blame Eddie"
German indie underground champion Lord Litter's latest release features more of his unique brand of acoustic folk-country songs. Litter has a raspy Tom Waits or Robbie Robertson type voice and passionate vocal style that lends depth and emotion to his songs. Litter plays all instruments including guitar (mostly acoustic), bass, drums, piano, banjo, and perhaps more. The songs display a remarkable grasp of melody, and all are well crafted to create completely accessible tunes that nonetheless include thought and variety. Many of the songs have a traditional country or general American folk sound, though embedded within many of them are snippets of whimsy and fun that make them Lord Litter's very own. Good stuff. And be sure to check out his radio show for the best in inpendent music from around the world. For more information you can visit Lord Litter's web site at: http://www.LordLitter.de. Just Blame Eddie is distributed by Orange Entropy. You can visit their web site at: http://www.orangeentropy.com.